Delhi Metro Connectivity To Be Extended: Modi. 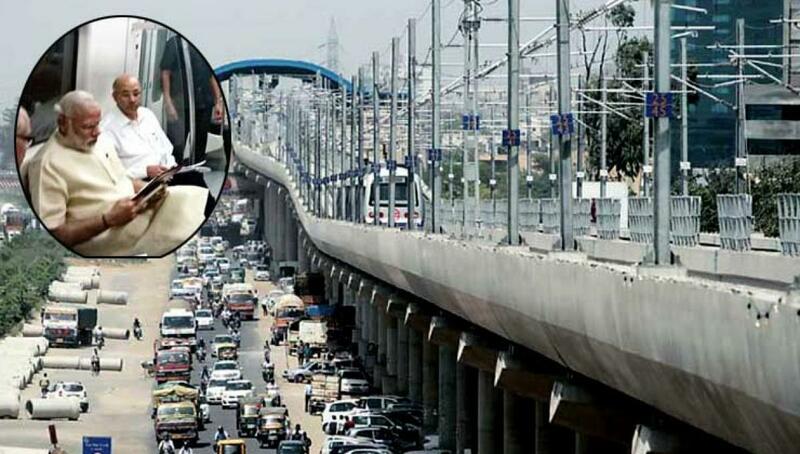 Prime Minister Narendra Modi on Sunday inaugurated a metro line connecting Badarpur in Delhi and Faridabad. Faridabad: Prime Minister Narendra Modi on Sunday inaugurated a metro line connecting Badarpur in Delhi and Faridabad in Haryana and said the metro connectivity would be extended up to Ballabhgarh to link an important part of the state with the national capital. A sum of Rs.700 crore would be spent on this project, he said while addressing a 'Gati Pragati' rally after inaugurating the Badarpur-Mujesar Metro link here on Sunday. Modi symbolically flagged off the metro train from the rally site and travelled on the metro train from Janpath in Delhi to Bata Chowk in Faridabad. He also said that Faridabad and Gurgaon in Haryana needed to be further connected through the Metro network. The 13.8-km Badarpur-Mujesar Metro link, an extension of the violet line between the ITO and Badarpur Metro stations, will have nine stations -- Sarai, NHPC Chowk, Mewala Maharajpur, Sector 28, Badkal Mor, Old Faridabad, Neelam Chowk Ajronda, Bata Chowk and Escorts Mujesar. About 1.95 lakh passengers are expected to use the new corridor every day by the year-end, which cost Rs.2,500 crore to construct. He said that with the inauguration of this stretch of metro, Haryana would be able to attract weekend tourists, which would in turn provide employment to the local populace. The prime minister said auxiliary electricity requirements of the metro stations on the stretch would be met by solar energy, the panels for which have been set up at the stations. Describing his association with Haryana, the prime minister said the state was his "second home" since he spent most of his time in Haryana after Gujarat. He said Faridabad was not new for him and he had travelled its streets on a scooter before he even became the chief minister of Gujarat.